Four men, two old, two younger, stand in a doorway marked 217. The actual address was 217 18th Street, the home of the Beardsley & Bailey wholesale liquor business for years, and various other Beardsley enterprises for decades. The men are likely the principals in Beardsley & Bailey. Beardsley refers to James Marvin Beardsley. James, who was born in 1843, is often confused with his 10-year-older cousin, Major James M. Beardsley – middle name undocumented – who also lived in Rock Island. Both served in the Civil War, where the major earned his rank. To add to the confusion, the younger James later earned an honorific “Captain” as a leader in Rock Island’s volunteer fire department. The Bailey in the business was George E. Bailey. 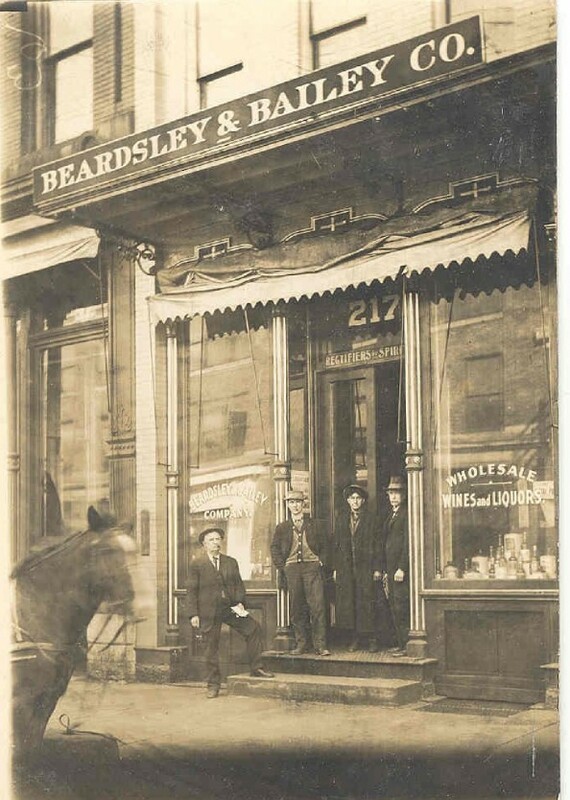 Beardsley Hodges & Co., a wholesale grocer in which Bailey was a partner, operated in this building in the early 1890s. Beardsley & Hodges also offered wholesale liquors from a 16th Street building. A few years later, Bailey moved both his home and grocery to a fine building at 1611 2nd Avenue, and McNevin & Gansert, candy manufacturers, took over both 217 and 219 18th Street. By the turn of the century, the liquor business came here under the name Beardsley & Bailey. James M. was the president, George E. was the vice-president, and Calvin, James’ youngest son, was the secretary-treasurer. The photo postcard, dating from about 1915 or earlier, likely shows James Beardsley, who would have been about 70, Calvin Beardsley, about 35, and George Bailey, probably a contemporary of James. The other younger man may be an employee. The building also housed another company, the Beardsley Specialty Co., managed by Calvin Lynde Beardsley. This business manufactured perfumes, a logical addition to the liquor business since perfumes are largely composed of alcohol. Above the door, a sign says “Rectifiers of Spirits,” implying the firm actually distilled higher proof liquors. Did that happen on this site? It’s possible, since Beardsley & Bailey did not have any other location. Yet Sanborn Fire Insurance maps give no indication of a still, surprising since the distillation process could be a significant fire hazard. The liquor business continued legal operation until 1920, when prohibition took effect. At that point the firm began to advertise “malt extract, wines, cider, syrup, and sweeping compounds.” Three of these could be used for home brew. The “wines” may have been grape juice for the purchaser to ferment. The sweeping compound is unexplained. James M. Beardsley died in 1928. Calvin became president, and his son, James R., was named secretary. Earlier they had opened the Beardsley Radio Shop here, selling radio apparatus and supplies. It would later be called “Jimmy’s Specialty Shop.” Calvin was a pioneer radio broadcaster, founding WHBF in 1927, and selling to the Potter family as Rock Island Broadcasting Co. in 1932. The wholesale liquor business never reopened after prohibition ended in 1933, although Calvin continued to sell malt extract for beer making. Calvin also continued operation of a printing business, which had opened at 2227 4th Avenue in the 1920s. Until it was demolished for the Centennial Expressway, his home at 1108 First Avenue was also the business address. The postcard shows a tall and elegant storefront surmounted by a wood balcony on ornate iron brackets. The business sign is mounted at the front of this balcony. Such balconies were present on many downtown Rock Island buildings in the late 1800s, even though no doors opened onto them from upper stories. As is typical of the era, the main level of the building was set slightly above the sidewalk level. Ornamental details on the fluted cast iron columns around the large windows are emphasized with contrasting colors. The comparatively slim cast iron, with its great compressive strength, easily supported the weight of upper stories while permitting maximum window area. Such iron storefronts were once common, but today only one remains in Rock Island. Located at 4th Avenue and 21st Street, its large windows are now mostly covered with plywood. Beneath the balcony, a folded awning partially covers the rounded window tops, which are also colorfully decorated. In the 1940s, the front of this building and the one to the south were “modernized” by covering with buff-colored brick. The cast iron columns were eliminated and modern plate glass panes were installed in the front windows. During the latter half of the 20th century, the postcard building was the home of Business Systems. About 25 years ago, the owner removed glass blocks that had been placed in the upper level window openings, to restore their original appearance. At the same time he created a spacious loft apartment on the second floor. This article by Diane Oestreich is slightly modified from the original, which appeared in the Rock Island Argus and Moline Dispatch on June 3, 2007.